What is your real estate attorney actually doing when he or she conducts legal and financial due diligence on your behalf? In New York City, a buyer’s real estate attorney is responsible for legal and financial due diligence on behalf of the buyer versus the buyer’s broker. Brokers are not allowed to provide legal, accounting or financial advice. Who Conducts Due Diligence for Buyers in a Real Estate Deal in NYC? Will My Real Estate Attorney Protect Me from Fraud in NYC? Is the Original Offering Plan Worth Reading in NYC? Should I Review the Co-Op or Condo Board Minutes Too in NYC? Once your buyer’s broker has found and negotiated a deal for you, your real estate lawyer will step in and analyze your target property for any legal or financial risks. An experienced real estate attorney will produce a real estate due diligence report which summarizes all of his or her findings, similar to the sample report we’ve included below. 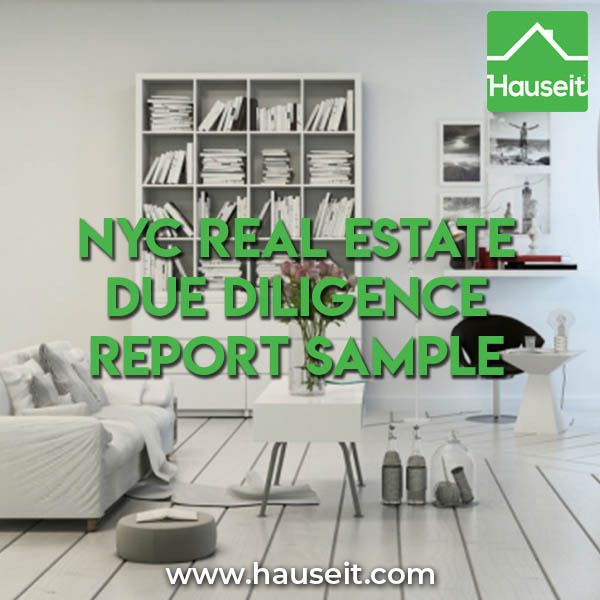 As you can see from the NYC real estate due diligence report sample we’ve included, a good real estate attorney will analyze the building’s annual financial statements, the building’s board minutes, check for violations and liens, and inspect the original offering plan and any amendments. If the target property is a condo, townhouse or a multi-family building, your lawyer will also order a title report and analyze it on your behalf. A good real estate lawyer from help protect you from most sale related fraud. You can uncover most value fraud yourself from perusing any number of useful real estate websites in NYC, such as the actual square footage of a condo unit. Value Fraud – when an important detail about the property is incorrectly advertised or misrepresented in a manner that makes the property appear more valuable. For example, a multi-family property is advertised as a four unit townhouse, but your lawyer finds out that it’s really a legal two unit property and the two additional units are illegal. Mortgage Fraud – banks are actually not required to notify a home owner when a mortgage has been taken out on their property. As a result, when it comes time to sell, some unfortunate sellers are surprised to hear from the buyer’s attorney about a mortgage on their home that they are completely unaware of! Often times, the seller may only discover that there is a fraudulent mortgage on their property when it comes time to sell. The criminal may have cashed out with the mortgage many years ago! Title Fraud – title fraud occurs when the deed to a property fraudulently changes hands, often without the knowledge of the rightful owner of the property. This is unfortunately quite easy for criminals to do. They can simply submit a fake deed to the NYC government, then proceed to cash out on your property with a new mortgage immediately after! On a positive note, many popular real estate websites provide up to date property records these days with data pulled directly from ACRIS. As a result, owners who search for their homes online periodically can rest assured when they see that they are still the owner of record! Estate sales – you will need to make sure all members of the estate are on board with the sale and that all taxes on the seller’s side are done correctly. Be especially careful if you are only communicating with one member of the estate. Often times one member of the estate will be more interested in selling than the other members, and you need to make sure everyone in the estate actually consents to the sale and will show up to closing! Multiple parties – sometimes a property will be jointly owned by different family members or even different business partners. Similar to an estate sale, you need to be especially careful when your primary contact is only one of the co-owners. You need to make sure that all owners are on board with the sale and will show up on closing day! Be careful even when the co-owner you are dealing with is very confident that his or her partner is on board. Often times that may not really be the case which will mean you end up wasting time and money! Divorce – it’s important to understand that one or both parties to a divorce may act irrationally and illogically given the emotional trauma associated with a bitter divorce. Therefore, don’t assume that either party will not do something illogical that is actually to their detriment, as sometimes they may want to do just that to hurt their former spouse. An example of this is one party refusing to show up to closing even though they need the money from the sale proceeds. Even though this behavior would seem irrational as they need the money, it may make sense in the moment for the aggrieved party as they believe not showing up to closing will irritate the other party. Short sale – these are not always the deals you may think they are! Keep in mind that you won’t have control over the timeline in a short sale as you’ll need to wait for the bank to approve the sale, if they ever even get to it! Sellers in a short sale may be motivated to try to cut a side deal with you for their personal property, such as barbecue grills or fixtures, which is not eligible to be repossessed by the bank. Sellers may try to ask for an above market rate for their personal property in return for a good deal on the house itself. Just be careful as most banks will require both parties to sign an agreement saying that they have not entered into any side deals. Tenants in place – be especially careful if you are looking to move in on closing date yet there are currently tenants in place, even if the seller says the tenants will move out by closing. The seller may ask to delay the closing last minute because the tenants aren’t moved out yet, at which point you are faced with a difficult decision. If you decide to close anyway, you must think about how you’re going to occupy the property. Evictions in NYC are a really difficult and time consuming process, and it’s not something you want to deal with when you’re expecting to start enjoying your new home. It’s up to you whether you want to read the offering plan yourself as it is a very lengthy document; however, your lawyer will always peruse the original offering plan on your behalf during contract due diligence. Keep in mind that the offering plan will be especially important to study when it comes to new construction because all of the information is fresh, new and relevant. Even the original offering plans for older buildings will be useful to peruse as they’ll offer important clues such as whether the layout for any apartments have changed. Keep in mind that the Attorney General “accepting” the offering plan for a new development only means that the offering plan has provided the required amount of disclosures to potential buyers. The Attorney General accepting an offering plan is not a substitute for due diligence by your attorney. Note: new development condo buyers will often be surprised during the final walk-through when they see their actual units for the first time because the actual windows are different from the ones they saw in the sales gallery originally. Often times in high-rise new construction homes, the actual windows will only open part way for obvious safety reasons, yet the windows in the sales gallery opened fully. This can be avoided by reading the offering plan which will have a disclosure on the actual nature of the windows! Most buyers are fine with just letting their attorney review the co-op’s or condo’s board minutes on their behalf. However, we recommend that you review them as well as only you will be able to tell if certain things about the building will be a nuisance to you or not. Keep in mind that most managing agents will only allow lawyers and buyers to review the board minutes in person at their office after having made an appointment. Therefore, if you’re interested in perusing the coop or condo board minutes yourself you’ll need to tag along with your lawyer during the appointment he or she makes. Keep in mind that there is no standard to how coop or condo board minutes should be written. Some coop or condo board minutes can be extremely short, with literally just a list of which board members showed up. Other condo or coop board minutes might be multiple pages in length, with meticulous recordings of the back and forth between board members. Keep in mind that many boards review the minutes and approve them before letting outsiders review them, so they may be sanitized in many cases. However, you may still be able to perceive potential issues down the road by reading the minutes such as a troublesome tenant on the same floor as you, or if you notice that the board is discussing whether to implement a flip tax. – 2014: Received and attached. – 2015: Received and attached. – 2017 Budget: Received and attached. Minutes: Read, notes in report. – Violation Search: Results in report. – Certificate of Occupancy: Attached. – Open Permits: Results in report; none against subject unit. – Violation Search: Results in report; none against subject unit. Memo Re: Treasury Report: Received and attached. Coop Guidelines: Received and attached. Tax Deduction Letter: Received and attached. House Rules: Received and attached. Maintenance Letter: Received and attached. Letter of Completion, 2008: Attached. Purchase Application: Received and attached. Sublease Application: Received and attached. Alteration Agreement: Received and attached. Certificate of Insurance: Received and attached. Most first time home buyers in NYC are shocked to learn that real estate lawyers typically charge only a flat fee of $2,000 to $3,000 on average for doing so much work! Your lawyer will ask you to sign an engagement letter at the onset of your relationship. Payment arrangements are negotiable and can vary, but typically half of the flat fee is paid upfront, and the second half is paid at closing. INSPECTIONS: PRIOR TO EXECUTION OF THE CONTRACT, YOU HAVE THE RIGHT AND ABILITY TO PERFORM A HOME INSPECTION. IF ANY DEFECTS ARE DETECTED THAT ARE NOT OTHERWISE PROTECTED BY THE CONTRACT TERMS TO BE IN WORKING ORDER AT CLOSING THEN AFTER THE CONTRACT IS SIGNED, YOU WILL NOT BE ABLE TO RENEGOTIATE THE TERMS AND CONDITIONS OF THE CONTRACT. AS SUCH PLEASE BE ADVISED THAT OPINIONS DIFFER AS TO WHETHER A HOME INSPECTION IS NEEDED BASED UPON THE TYPE OF TRANSACTION. * FINANCING CONTINGENCY: Your Financing Obligations are set forth in Paragraph 1.20.1 of the Contract. THIS IS CONSIDERED A CONTINGENT TRANSACTION. You are REQUIRED to obtain a mortgage commitment letter for the loan amount of $[AMOUNT] within thirty (30) days from the date in the contract. If you are unable to obtain such letter, you will have to furnish a denial letter from your lender so we may obtain your Contract Deposit back. Failure to provide such letter if you are denied will result in losing your Contract Deposit of $[AMOUNT]. *Please note that if the contract’s closing date is stated as “on or about,” then the closing date is not fixed and either party can post-pone the closing up to 30 days after this date. Per the Schedule A, Unit [NUMBER] is 2,700 square feet. [ADDRESS], also known as [ALTERNATE STREET ADDRESS]. The building was probably built at the turn of the century, but the city’s building department records are missing. The building contains seven (7) stories and a penthouse, a cellar and a sub-cellar. [COOPERATIVE CORPORATION NAME] was formed in order to acquire the property located at [ADDRESS]. It is a qualified Cooperative Housing Corporation under Section 216(b)(1) of the Internal Revenue Code and contains 60 residential apartment units. The primary purpose of the Corporation is to manage the operations of the property and maintain the common elements. MAINTENANCE FEE: $2,400 per month. UTILITIES INCLUDED: Heat, hot water and sewer. CURRENT ASSESSMENTS: None per management. UPCOMING ASSESSMENT: Work on the 2016 financials has revealed that expenses were under budget, but repairs & maintenance and elevator contract & repairs expenses were much higher than budgeted. A number of upcoming capital expenses are still in the estimate phase, but it is anticipated that expenses will exceed $300,000. It is extremely likely that a capital assessment will be implemented later this year. Please see attached memo regarding the treasurer’s report for further information. **Please be aware that a Cooperative has the ability to approve and pass an Assessment charged to Shareholders at any given time. FLIP TAX: $25.00 per share, payable by seller. ** Please keep in mind that the Board has the ability to institute a “Flip Tax” if approved. It is important that as a Shareholder of the Corporation, you pay close attention to all notices that are sent to you and that you are in attendance at the annual meetings that are held. – Seller received the abatement. – The cooperative puts on an assessment at the same time that the abatements are distributed – all shareholders must pay regardless of if they receive the abatement. – STAR abatement was not received by seller. **The Move-In Deposit is held by the management agent to ensure that damage does not occur to the building during your scheduled move-in date. After your move-in is complete, the money will be refunded to you providing the building superintendent states that all went well and no damage has occurred. **In the event your lender appoints our firm to handle the transaction, our legal fee will be reduced to $2,000.00. o Storage is available in the building. o Parking is not available at the building. o Bicycle storage is available. o Notifications for moves must be made in advance. o Moving is prohibited on Saturdays, Sundays and Holidays and is limited between the hours of 9:00 AM to 5:00 PM. o All alterations/renovations must have an application submitted and the plans approved by the board. The approval of the alterations is dependent upon the approval of the Cooperative Board. Please see attached alteration agreement for further information. LANDMARK BUILDING: The Building is denoted as an Individual landmark by the New York City Landmark’s Preservation Commission. As a result of such designation, no alterations may be made to the façade of the Building which are visible from the street, without the consent of the Landmarks Commission. o LOT LINE WINDOWS: None per management. o LEAD PAINT If pre-1978: YES – Please see the EPA Lead Based Paint Addendum & Corresponding Booklet. TERMS: Equal monthly installments of $[AMOUNT] applied to interest only at the rate of [RATE]% per annum. As part of the requirement, the Corporation must maintain at all times a general operating account and replacement reserve of no less than an amount equal to 15% of the previous year’s maintenance charges. LINE OF CREDIT: $[AMOUNT] – Interest is calculated at [RATE] percentage points or the sum of the yield for the 30-day LIBOR, plus [RATE] basis points. Interest only payments are due for the first five years after the initial advance. Thereafter, principal in the minimum amount of $100 and interest will be paid monthly until it matures on [DATE]. PET POLICY: Allowed with Board Approval; no aggressive breeds. Please see purchase application, and page 2 in the house rules for further information. PIED A TERRES: Permitted on a case by case basis. PARENTS ALLOWED TO BUY FOR CHILDREN: Not permitted. GIFTING: Permitted on a case by case basis. PURCHASING IN A TRUST / UNDER AN LLC: Not permitted. Under the provisions of Section 216 of the Internal Revenue Code, a tenant stockholder of a Cooperative apartment is entitled to deduct from personal gross income a proportionate share of interest and real estate tax paid or incurred by the Cooperative Corporation. Note that these deductions are generally available if the taxpayer itemizes tax deductions. If the shareholder is granted any real estate tax abatements, reflected in a maintenance credit or received by check, the real estate tax deduction as stated above should be reduced by the amount of the abatements that are received. PENDING LITIGATION: None per management. FINANCING ALLOWED: YES – A Maximum of 75% of Purchase Price is allowed. HAS THE COOPERATIVE BEEN NOTIFIED OF ANY VIOLATION OF ANY GOVERNMENT OR LAND-USE REGULATIONS? The New York City Department of Buildings website shows ten (10) open violations, almost all pertaining elevators, and no open ECB violations. The New York City Housing Preservation and Development website shows no open violations. CERTIFICATE OF OCCUPANCY: Effective September 11, 2001. Please see attached. ROOF: Replaced six years ago. BOILER: Upgrade two years ago to gas. UPCOMING WORK/ REPAIRS/ REPLACEMENTS: Local Law 11, do not have a price yet and do not know how it will be paid yet. LOCAL LAW 11: To be performed next year. LEAD PAINT: (pre-1978) YES – Not a known problem, but due to the building’s age, there will be lead paint somewhere. Please see EPA handbook & Rider to Contract. BED BUGS: None per management. WATER LEAKS: None per management. NOISE COMPLAINTS: Yes, please see notes below. ODOR COMPLAINTS: None per management. SECURITY ISSUES: Yes, please see notes below. • Upcoming capital expenses: likely to exceed $250,000 total. It is extremely likely that a capital assessment will be implemented this year. • The line of credit obtained with the underlying mortgage is also available should interim funds be needed. • Water tank replacement to begin this fall. • Water tank: estimated that the project will cost about $120,000 not including the steel work also required. • Local Law 11: Back metal staircase must be removed – approx. $25,000. • Multiple bids will be obtained for the above. They are not part of annual budget. Board will explore options for how to address. • Lobby has been repainted, touchups needed. • Local Law 11: inspection will be performed in late 2017. • Water tank replacement: the three water tanks need to be replaced. • Estimate for lobby painting presented. • Reported that there have been trucks and buses idling in front of [NEIGHBORING BUILDING’S ADDRESS]. • Current elevator issues discussed. Noted that elevator was rattling. • Local Law 11 due next year and that the issue with the rear staircase will need to be addressed at some point. • Currently projecting a 1% maintenance increase. • Elevator Repairs: was out of service for approx. three weeks as parts had to be manufactured. • Repairs, maintenance and plumbing expenses are extremely high and could result in budget deficit for 2016. • Noted that the water tanks should be replaced over the upcoming years, prices to be obtained. • Board discussed street fairs held on [NAME] street. Shareholders encouraged to write to community board. • Loud screeching noise from a/c at [NEIGHBORING BUILDING’S ADDRESS]. They have been contacted, but no resolution yet. • Reserve balance for 2015: $265,000. • The maintenance increase in 2017 was likely based on the continued projected increase in real estate taxes. • Additionally, Local Law 11 inspection of the building is coming up and there is no indication as to what, if any, repairs will be necessary. • The boiler and domestic water heater were replaced. • New intercom and security cameras successfully installed. • Brief discussion re: construction next door which is affecting on apartment. He is waiting for survey from title company, once received a meeting will be scheduled to review and determine if work is permitted. • The reserve fund balance will be approximately $200,000, equal to three-months maintenance as recommended by auditors. • Intercom installed and working well. • A discussion was held with respect to an issue brought before the Board and management regarding construction by a neighboring building blocking a lot line window. It was noted that construction is legal and that neighbors are within their right to build up. • Discussion re: request from some shareholders to be able to install a/c condensing units in public areas of building to service their units. Board to review. • Letter from shareholder who received a letter from management regarding children playing in the hallway and dog leaving sticks in the hallway was discussed. • New intercom system – install is scheduled to begin March 1. • The newsletter will remind shareholders to clean up after dogs and to keep common areas clean. • Three sample LED light fixtures with sensors for the stairwells to be installed. • Exterminator sign-up sheet located in the lobby. • Management in the process of obtaining quotes to make repairs to the roof over the laundry room. • Contract has been signed for intercom/security camera install. New key fobs will be issued to each apartment. • Some complaints have been received of black flies in some apartments. • A complaint received about children and a dog playing in the fifth floor hallway. • 2016 budget includes no maintenance increase. • No shareholders in arrears. • A meeting has been scheduled with Verizon re: Fios. • Complaints have been received about children playing in the hallways. • Gas leak was caused by old pipes in the street. • A few shareholders in arrears. Those who have persisted will be referred to the co-op’s attorney. • Boiler should be complete shortly. • We are currently projecting a probable increase to our Real Estate Tax expense of about $50,000 for 2016. • Flip Tax/Reserves: We currently have approved 3 resales this year and another unit is currently on the market. Once these funds have been transferred to our reserves, there will be around 4 months of maintenance. This is an appropriate level for now, keeping in mind upcoming intercom/security and Local law 11 expenses. • Currently projecting net savings of $20,000 in annual expenses. This will probably be used to offset any draw downs from the reserve for the intercom/security. • Repairs/maintenance expected to be considerably over budget. • Boiler update: the natural gas water heater is up and running. Several issues with the boiler which were discussed with building’s engineer. • ConEd has been working on the street to repair a gas leak. • Security concern: 15 teenage girls were recently on the roof sitting on the ledge taking photos. NO ONE CAN BE ON THE ROOF OF THE BUILDING. • The board is considering better monitoring of certain areas with cameras. • Payroll will be over budget due to retroactive payment to the super. • Repairs and maintenance currently projected to be $15,000 – 25,000 over budget. • Agreed that late fee policy will be more strictly enforced. • Boiler conversion project: letter received from ConEd that it will be 2 to 4 weeks before a meter is installed. • Intercom proposals being received. • $150,000 spent on capital improvements for the gas and boiler conversion. At the end of 2014 there was $220,000 in reserves – down approximately $230,000 from the prior year. • RE tax abatement due to expire this year and if it is not renewed maintenance will need to be increased by approximately 4%. • All shareholders current on their maintenance; but the late fee should be revisited at an upcoming meeting as there have been a number of delinquencies over the years. • Two proposals received for installation of back-flow preventers which are required by the city. • The basement area will be improved with new light fixtures, paint and signage. Ms. Hicks advised that she has been working with the Accountant on the 2016 audited financial statements. Total expenses were under budget. Repairs & maintenance and Elevator contract & repairs expenses were much higher than budgeted. These were offset by other categories where spending was under budget, including heat, corporate taxes, real estate taxes and water & sewer charges. A draft of the financial statements will be distributed to the Board for review and approval. Upcoming capital expenses were discussed. A number of them are still in the ”estimate” phase, but it is anticipated that expenses will exceed $250,000. It is extremely likely that a capital assessment will be implemented later this year. The Line of Credit obtained with the underlying mortgage is also available should interim funds be needed. The Board will discuss financing options at an upcoming meeting. The Local Law 11 facade inspection was performed last week and specifications have been prepared. Much of the work required can be done next year. Some work will be performed in the back of the building and the rear staircase will be removed as soon as permits are received. Hallway Light Project: Mr. Lam advised that he is still waiting for the light fixtures and ballasts for the hallway lighting project. The LED strips for the staircase light fixtures should be received next week. Proprietary Lease Expiration – What if a Co-op Proprietary Lease Expires?